This post was originally published on May 3, 2009. It was substantially revised and re-posted on September 14, 2015. Chances are you know a woman who answers to Nicole, Danielle, or Michelle. But what about this French feminine form of a masculine classic? 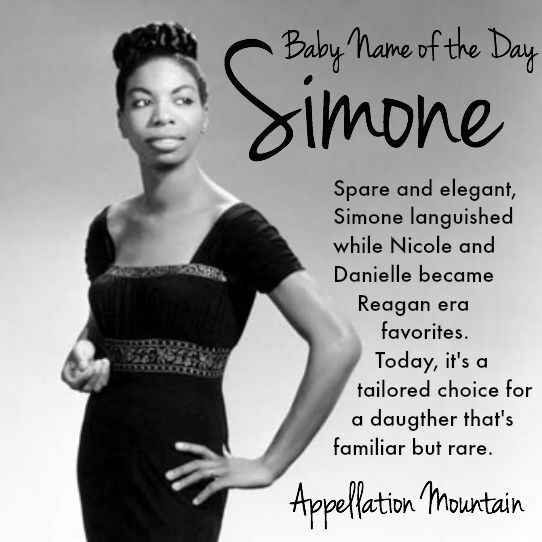 Thanks to Toni for suggesting Simone as our Baby Name of the Day. Danielle peaked at #14 in 1987, Nicole at #6 in 1982, and Michelle at #2 in 1971. Simone actually peaked in the same ear. The name reached #310 in 1988. That’s still far enough out of the spotlight that Simone doesn’t feel like an 80s name at all. 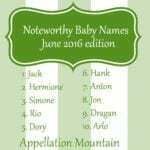 Today the name ranks a mere #728, despite our continuing affection for French names for girls. The Spanish Ximena and Jimena are more popular. In fact, Ximena and Jimena have longer histories of use. They were recorded as feminine forms of the Biblical Simon as far back as the tenth century. 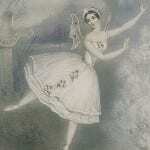 Simone surfaces a few centuries later. Simon, of course, comes from the Hebrew Shimon, meaning “he has heard.” In the New Testament, Simon was one of the apostles, renamed Peter – rock – by Jesus. 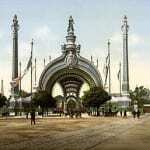 In the early part of the twentieth century, the name was huge in France, peaking in the 1920s. 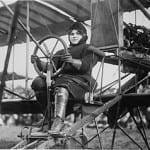 That might be thanks to early French actress and writer Simone le Bargy, born Pauline in 1877. Feminist writer and philosopher Simone de Beauvoir. Ocean-going partner to her more famous husband, Simone Cousteau. French actress Simone Simon, best remembered in the US for her role in the 1942 classic Cat People. That’s her in the picture. Simone Signoret was the first French actor to win an Academy Award, for her role as Alice in 1959’s Room at the Top. Eunice Kathleen Waymon was a classically trained pianist, the daughter of a Methodist minister. Her minister mother nurtured her daughter’s love of music, but not of the popular variety. When Eunice started playing in clubs for the money, she adopted a stage name to avoid her mother’s disapproval. Clubs were also the venue where Nina started to sing, and it was her voice that earned her an agent and an album. Nina came from the Spanish word for little girl, a nickname a boyfriend gave her. Her new last name came from the French actress Signoret. It was a choice that befit a future legend – unexpected and sophisticated. The singer is known not only for her music, but for her deep commitment to the Civil Rights movement. 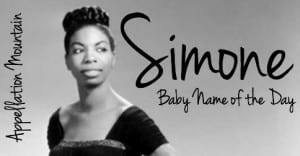 If Lennon and Hendrix are musical hero names, surely Simone belongs in their company. Young actress Raven-Symoné graduated from The Cosby Show to her own hit series on the Disney Channel. (Ignore the accent. Symone is pronounced exactly like Simone.) Despite her popularity, the name slid for most of the 1990s into the new millennium. A few sparing uses in recent years have failed to boost the name. There was a 2002 Al Pacino movie called Simone, but it wasn’t a hit. I think it’s a mystery why we haven’t heard more of Simone. Maybe it isn’t more popular in the US because Simon has never cracked the Top 100. Overall, if you’re a nickname-proof name that manages to sound sophisticated, familiar and comfortably underused, Simone is one to consider. Would you consider Simone? Why do you think we haven’t heard more of this name? I know an 8 yo Simone. It’s a beautiful name. Simone was a popular name in the 1980s in Australia, and I think of it as being in “mum territory” now. Although it is a pretty name, and I don’t think would be weird on a new baby. I would consider Simone for a middle name. I think it’s lovely! Maybe it’s not so popular because of the “moan” sound. This is a very meaningful name for me. Simone is the name of my fiancé’s sister who passed away several years ago. For this reason, it would be very special as a middle name for a future daughter. Personal connections aside, it strikes me as an elegant, graceful name. It’s a name I come across in SA -nowhere near vintage for me, as I was told by a name expert on YA. It’s one that had to grow on me. Strictly a middle name option. I considered Harper Simone, for awhile. Simone’s really pretty. The only one I have known was spelled Samone, which almost killed it for me, but I still like it. Definitely a sultry, smoldering name. I’m too lazy to look up that stats, but I’mpretty sure Simone’s a little more popular down here than i the US.She wasn’t top 100 material last year, but I’d definitely say she’d have been somewhere in the large vicinity of 300-700 ish? I’ve always known at least one at any time growing up – quite a few around my age (born early 80s). Right now she’s a 10 year old sister of one of my DD’s friends, and a 10 month old whose mother was at the hospital with me! Well, I *want* to like Simone. After all, I have a Simon. But Simone’s another “I can’t look at it stright” sort of name, like Lana & Charlotte. Sim One is what I see. And yes, it’s a movie with DeNiro in it. But I don’t mind it on anyone else’s kid and really wouldn’t mind seeing it more often as it is a pretty name. It’s just not for me. I’ll second Photoquilty’s Corrine suggestion. My other half brought up Corinna today and it has me going “Hmmm”. I like Corinna’s historical link, why not Corinne? On another note, I love how you shared your thoughts on the pointless accent mark in a certain teenstar’s name. 😉 If you know me, you know that poor grammar is a big no-no.